Boston Skyline, Winter from a watercolor painting by Thomas Rebek. 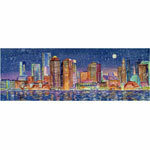 The card image wraps around to the back to create a wide panoramic view of the Boston skyline on a wintry evening. Cards are 7" x 5" and come in a box of 10 cards with envelopes. Inside message: Wishing you all the Joys of the Holiday Season. Cards and envelopes may be imprinted. Please specify imprint color and text at right.